Save on a Stressless City High-Back with Ottoman. Authorized Discount Models. The Stressless City Chair is one of the many popular models offered by one of our favorite Norwegian Recliner Brand. The firm, tight stitching allows for a strong support of the lower back and hips. The straight, vertical seaming of the comfort zones allows for parallel support of each side of the major back muscles. This chair is an exemplary demonstration of Ekornes' Comfort Expertise. Choosing Unwind is the best way to save time and money when ordering this chair. Ask about our in-stock selection for the quickest shipping options. Have Questions or are you ready to order? Drop us a chat (click the chat button at the top of the page) or a line at 888-486-9463 or 1-601-932-5111 (Internationally). View our Blog to learn about what’s new and exciting in detail or drop our Ekornes Brand Specialists a line. They can explain the specifics of each product and help direct you to money-saving opportunities. On most Stressless Recliner models, you can choose a matching accessory. These include: the useful Ellipse Table, or the stylish Urban Table. This model was introduced in the Summer of 2014. It has quickly become very popular with those that are slightly taller than average. The High Back City with High Base reaches 45.5" at its highest. That is guaranteed to be tall enough for many. Order one of our stocked colors for fast and stress-free shipping to anywhere in the nation. This model while smooth and crisp features thickly padded cushions. It's a perfect time of year to purchase from the new, polished steel, Stressless City lineup! This relaxing chair and ottoman series insures proper head, neck and back support and includes many comfort features that add to the appeal of the new modern styling. The Stressless City recliners allow you to sit without strain or sore muscles for many hours on end. These new beauties have been among the fastest-growing, newly launched Stressless recliners at Unwind. Ekornes Stressless City High-Back Recliner with High Base and Ottoman. Talk about stylish. The Stressless City looks as great as it feels. When you sit down, prop-up your feet and experience true Norwegian comfort, no other recliner will do. It's easily overlooked that the Ekornes City Recliner brings home the same back and neck-saving features that all Stressless Recliners and sofas are famous for throughout the world! - The low center-of-gravity and optimized support provide your body with balanced support for an almost weightless sensation. - The Stressless Glide Technology allows your seat to move and adapt to your body's movements without the use of a motor or any complicated mechanics. This incredible technology uses "glide wheels" to allow your body weight to do all the work. Prefer more or less reclining tension? No problem, simply grab the glide wheel knobs and give them a twist. Typically once these are set, there is no need for further adjustment in the future unless someone else is sitting in the recliner with different comfort preferences. If this happens often, you might want to consider getting your spouse their own Stressless recliner. After all, a comfortable couple is a happy couple. - The Plus System continually provides superior support for your head, shoulders, & lower back. The engineered lumbar support moves and adjusts because your body moves and adjusts. - The easily-moved ottoman also features a built-in Tilt System that adjusts to your body movements for the ultimate in comfort. You can't help but notice the extra thick layer of cushioning on the Stressless City recliner ottoman. The ottoman also doubles as a soft, separate stool by flipping it upside down and locking the 4 plastic clips. With this much padding on the ottoman, it really does a great job as an independent stool. - Stressless Recliners and Accessories are designed to last a lifetime. The manufacturer provides a 10 year Warranty period at no cost because they are so confident in their premium products. - There is a specific size match and seating style for almost everyone - Almost all recliners are available in 2 sizes (medium and large) and some are available in 3 (small, medium or large). The sofas are available in two sizes (medium or large). Want to see informative Ekornes Stressless Recliner videos? . 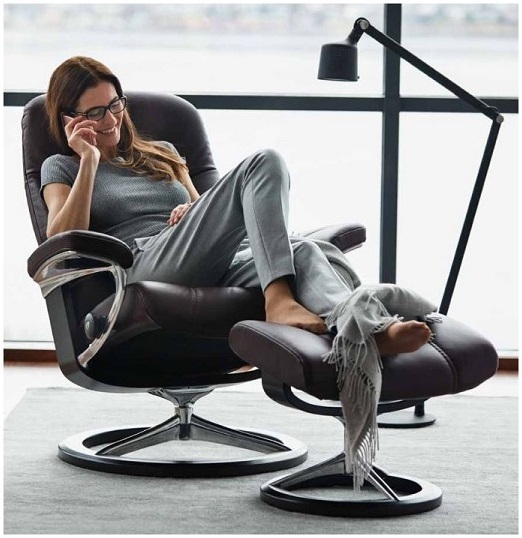 The Ekornes Stressless City recliner offers great comfort and support- especially to those who are of average size and weight. For additional details visit the item's product sheet below! We invite you to grab a book, kick-up your feet and sit in the Ekornes Stressless Metro for a few moments- You'll be glad you did- we guarantee it! 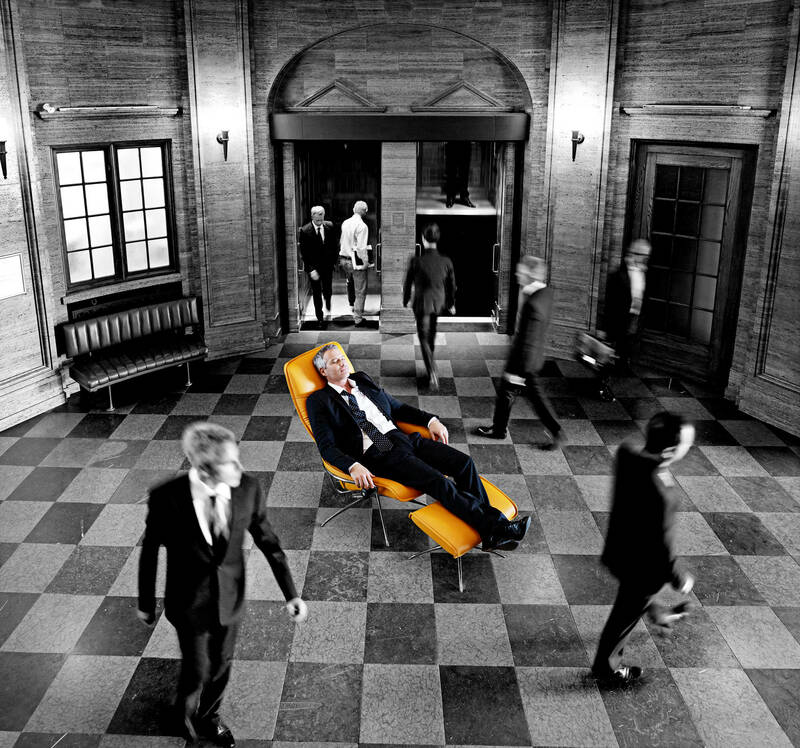 It is no wonder that Ekornes City Recliners are Exclusively Endorsed by the American Chiropractic Association (the ACA). Come visit the Unwind Back & Body Store to experience the Stressless City Recliner for yourself. If you have already decided and are ready to order, simply call (888) 486-9463 to speak with one of our Customer Service Representatives. Please review our return policy prior to ordering or call 888-486-9463 for personal assistance. You may also email stressless@unwind.com anytime- 24 hours, 7 days a week. Chair: Width: 31.5" Height: 45.5" Depth: 28" Ottoman: Width: 21.5" Height: 22.5" Depth: 15"
Fantastic 10 year Warranty from The manufacturer, Ekornes.